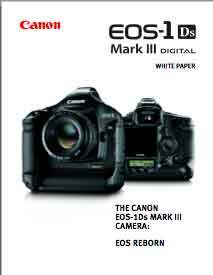 EOS 1DS Mk3 news and info. This page, which is still active and updated, includes technical specifications, updates (such as firmware) and reviews. Although technically superceded by the 1D X (launch Oct 2011, ship July 2012) I’ve chosen to keep my 1Ds mk3 as my principal camera (some of my reasons). Canon has released a new version of DPP (V3.5.1) that amongst other things now supports the EF 24mm f/1.4L II USM. 11th Whoops, that price below should be $6999, although I’d not be surprised to see it at $6199 by next spring. October 31st Another B&H fall ($195) to $7199, although perhaps showing some of the strength of the US$ at the moment? In the UK, the price seems to have slid somewhat over the last couple of months to just over £4400. 23rd I’m told that B&H in the US (who follow suggested prices) have dropped the price of the 1Ds mk3 by $100 – I’m expecting to see some quite noticeable cuts once the 5D Mk2 starts shipping, particularly with the likelihood of a replacement for the 1D3 announced by Feb/March. There are also quite a few second hand (refurbished) 1Ds Mk3 appearing in the UK, but they still seem to be holding their price. Could Canon be trying to shift them out of the way while the prices they can get are still at high levels? Remember though, that I’ve jumped from a 1Ds to 1Ds3 so there are quit a lot of changes in subtle operations of the camera that I might not notice. The 1DsMk3 has led me to be far more careful with focus – those higher resolution files show up errors more than with the 1Ds. I’ve activated the assist function in the AF and most of the time use a single AF point, selected with the joystick/button thingy. I have noticed that the AF sometimes jumps when supposedly focusing on the same object, however I’ve got nothing to make a real comparison with, and it’s not common anyway. Am I happy with AF performance for my work? Yes. Is the 1Ds3 the best camera I’ve ever regularly used for working? Yes. I’ll be interested to hear of others’ experiences with 1Ds3 AF, since I know my own styles of working are hardly a harsh test ;-) …particularly since several of my lenses are manual focus. May 5th Well, I updated the firmware on my 1Ds3 and I have to say, the most useful feature for me, is to be able to move selected focus point with the joystick/button. I’d not noticed problems before with AF (other than it was better than my old 1Ds) but reports I’ve seen suggest that it is a bit better in low contrast situations. The update process is really simple, just be sure to follow the instructions carefully – it does take a few minutes. I used a full battery rather than mains adapter during the process. 2nd Note that there appears to be a slight glitch with the warranty extension web site, in that it asks for your date of birth rather than purchase date – this results in your warranty being extended to your second birthday. 1st I’ve been checking the AF accuracy of my 1Ds 3 and setting the AF microadjustment for a couple of my lenses that needed it. I was using a test image I was recently sent and have put together some notes on AF Microadjustmentshowing how it works (with a version of the test image). February 27th US stocks seem at better levels now – for example, see this DPR thread for a US dealer with quite a few in stock. There’s more AF related news for the 1D3 as well. 26th Prices in the UK seem to be slipping downwards, perhaps ready for the March rebate scheme (1Ds3 isn’t in this but quite a few lenses are). The £150 seems to be the Canon UK rebate that’s starting on March the 1st. More info on the Canon rebates will appear on this Canon site. 21st There’s discussion of a recent BJP (UK mag) ‘review’ of the 1Ds3 over at DPR. The review finds that great results are possible with the camera, but that several Canon lenses are (in their opinion) not really up to what the camera needs. The report mentions both the 24-70L and TS-E 24mm, both of which have been strong contenders in the ‘due for update’ lens rumours of late. Canon Europe are having another round of rebates (5D/40D/400D and lenses) it starts on March 1st and runs to the end of June – details on the 5D2 page. 13th I had a chat with Canon Elstree (UK) this morning and will be dropping off my 1Ds3 for a viewfinder alignment fix (3-4 days they suggested) when I’m next working near there. 0.4 degrees may not sound much, but it’s easily spotted in images where I’ve used the ruled focusing screen to line up a vertical or horizontal. I’ve got quite adept at estimating a half degree ‘compensating’ tilt, but I would rather not have to… The tilt has actually got me to try using liveview more than I might otherwise, which is not an altogether bad thing, since I’d probably overlook it after years of using the ‘proper’ viewfinder. A half page article titled “More grief for Canon” accompanied by a nice picture of a 1Ds MkIII. I quote…. ‘We are aware of some issues relating to the viewfinder alignment,’ a Canon spokeswomen tells BJP. ‘The issues are currently under investigation. If any customers are experiencing such issues we are asking them to take their camera to their local service department for checking.’ Canon says it will release more information about the problem at a later stage. Update – CPS in Sydney have told someone else that there is no recall that they know of, and acknowledged that the tilt/misalignment problem involves adjusting two screws. January 26th It seems that not only are repairs slower at Canon, Irvine, but they can’t necessarily fix the fault either. I’ve heard from someone who got a camera back “viewfinder assembly adjustment was incorrect (parallax too large) and that adjustments were corrected” and the 0.8 degree tilt had been fixed… to about half a degree. 24th Are you waiting for a 1Ds3 from a Hong Kong supplier? I had a lengthy mail today (thanks) covering just what the 1Ds3 supply situation in HK has been. 23rd While it appears that in the UK and in Australia, Canon have got their act together on the alignment problem, in the US I’m hearing a much worse story. A couple of people I’ve heard from today, have both had their camera at Canon’s service centre at Irvine for over two weeks and are still waiting. One called only to be told that it had just been looked at and some parts were needed. In the little information that they were able to get it seems that the Irvine service centre is extremely busy. 12th If you’re looking to maximise the speed of writing images to cards, a card like the the Sandisk Extreme IV certainly makes a difference. There’s a DPR thread with lots of people timing different situations with a 1Ds3. For maximum speed it helps to turn off JPEG shooting with raw. 11th Some good news on supplies. I’ve heard from several people now, of stores receiving regular shipments of a few 1Ds3s. Whilst not exactly filling the shelves they don’t seem quite so difficult to find. 7th Another mail from a new 1Ds3 owner here in the UK. Since they need accuracy in the viewfinder (architectural work) they quickly tested the tilt. At about 1 degree out, it’s gone back to the dealer. I’m keeping mine here for the time being and have been experimenting with using liveview for critical shots (where I’d be using a tripod anyway). I’ll be getting it fixed at some point, but since Canon have said it’s a warranty adjustment, I’ve got until October to sort out when I’m going to lose the 1Ds3 for a bit. I’ve also added a second pair of pictures from someone’s 1Ds3 in the US, showing the effect, to the test page. 2nd Is the viewfinder properly matched up to the sensor in your 1Ds3? I’d seen a few of forum posts over the holidays and today had an email from someone who’s 1Ds3 has a pronounced tilt. It seems that B&H briefly had some 1Ds3 stock, but needless to say they didn’t hang around long. It seems that 1Ds3 stocks are still relatively low in the US (certainly at the larger dealers). As a regular traveller to the US I noticed the new ‘Lithium battery’ regulations for US air travel. Shouldn’t be a problem for most people, but take a couple of spare lithium batteries for your laptop as well and you need to check carefully. It doesn’t help that the regulations might require TSA staff to make calculations involving ‘equivalent lithium content’. Anyway I’ve put up some links and info on the Canon battery info page. “This firmware update (Version 1.0.6) incorporates the following improvements and fixes. Improves the reliability of communication with some CF cards. Fixes a phenomenon that occurs in some cases involving colour cast and vertical lines appearing in images. 13th I do have to keep reminding myself that I’m using a different camera when using the 1Ds3. 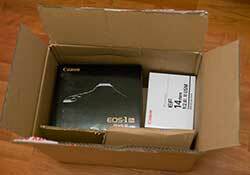 Canon have posted aPDF about getting the best out of the 1D3 and 1Ds3 – well worth reading. 10th At last, the RG article about the 1D3 AF has been posted, and suggests that the AF in fixed 1D3 cameras with the 1.1.3 firmware is a great improvement. However there are still some caveats where RG still says that sometimes the 1D2N works better – particularly in bright sunlight. An apology to anyone who mailed in with questions using the email address on the 1Ds3 notes page – the email hadn’t been set up correctly, so the mail would not have got through… it now works. I’ve had reports from people having dificulty with various CF cards just not working in the 1Ds3. In particular I’ve heard problems with a Sandisk Extreme II (4GB) and there is also mention of this same type (8GB) in a DPR thread. 5th Although not currently in stock, a number of retailers are dropping their headline 1Ds3 prices. In Brisbane, Photo Continental have gone to AUD $11,000, although with one body delivered last week and a waiting list, it’s only a possibility of delivery before Christmas. I also heard that Calumet in the US say that they did actually have one 1Ds3 delivered last week, but no more as yet. 3rd Several people have asked if I’m still updating this page as well as my 1Ds3 notes page now I’ve got a 1Ds3? – most definitely! Buyer Beware – already the 1Ds3 is appearing on eBay. If it looks too cheap, then it’s a scam. There were not that many 1Ds3s delivered in the first batch. From a personal point of view I hope any real ones that do appear on eBay won’t make people much money either. In the US there still appears to be some confusion as to when any of the large dealers (B&H, Adorama etc) will have any 1Ds3s available. There are people in the US with the camera, but these all seem to have come from smaller ‘pro’ dealers. One suggestion I had, was that any cameras the big stores did have went straight to very big corporate clients. Updated… I’m told that none of the big 4 US retailers (B&H, Adorama, Calumet and Ritz) had received a 1Ds3 by the 1st, so they couldn’t have favoured corporate clients. The big retailers (in the US) are being told [DPR] that it will be 2-3 weeks before they get their delivery. November 30th Lots of dealers throughout the world are getting initial shipments today. From what I’ve heard, many are only getting a small proportion of their initial orders, although most are now expecting regular shipments every 7-10 days. 28th In the UK I”ve just heard that Park Cameras now has their first delivery of the 1Ds3 due this afternoon. I’ve had quite a few people ask how many cameras are shipping in the first batch of deliveries from Canon? Only Canon knows for sure, but the best information I’ve had from Japan (thanks ;-) suggested that some 200 cameras were released in Japan, part of a total of about 2500 worldwide. Of course there will be more shipments fairly soon, but even large dealers in Japan were saying that if you order one today, then expect a few months wait. In the US, Canon have told many dealers to expect some cameras by the end of the week, and at AJP in the UK they only had 4 of their initial order of 14 shipped. Now that the 1ds3 is finally shipping, quite a few dealers are putting on demo events. For example, at Foto Care in New York, there is a 1Ds3 event (with Canon people) on the 4th of December. 27th Don’t expect many 1Ds3s in the first delivery… one comment suggested that there were only a ‘few dozen’ in the first shipment to Australia for example – that’s for the whole country. In the US Calumet are saying that they are getting some at the end of the week, and that people on the waiting list should call on the 30th (Friday) to see who’s getting one. The limited 1Ds3 supplies are leading to some pretty pessimistic timings for getting one if you are not already on a list. I was told of one European dealer who suggested that if you wanted one, then April was a reasonable date to expect it. 25th I’m told (thanks) that an enquirer to Canon in Canada was informed that 1Ds3’s are in a warehouse in Calgary, waiting for the official release announcement from Canon HQ on the 6th of December. 24th A caller at York Cameras (a London Pro dealer) was told that “they will be surprised if they see the 1Ds3 before Christmas”. Whether this was seeing any at all, or just that the initial quantity was so small that they were spoken for, wasn’t clear. 21st I’ve been sent quite a few reports from people suggesting that there will be an initial shipment of cameras next week, now that Canon have set a date on their main site. A comment on DPR suggested 10 for a dealer in Boulder CO, which if true, might suggest that Canon have held back from an initial delivery so as to be able to ship more when the first batch goes out. However, I’m told that Canon US have dropped the ‘Available November 2007’ note from the 1Ds3 page. That’s as close as you are going to get to Canon saying that dealers aren’t going to get many cameras from their initial orders. 16th In Japan I’m told (thanks) that Canon is saying that the camera is launched on the 29th November. 15th At LL there is now an overview of using a 1Ds3 for a while by MR. Don’t expect DPreview type of testing, more the considered thoughts of someone using a camera for real and taking some 5000 photos. In the US I was told (thanks) that jr.com were now saying ‘December 15th’ for deliveries rather than their previous ‘Mid November’ guestimate. We are delighted to invite you to the Canon 20twenty event which celebrates the release of the new Canon EOS-1Ds Mark III and 20 years of Canon EOS. Canon has raised the stakes in the professional photography market with the launch of the 21 Megapixel, 5 frames per second EOS-1Ds Mark III. Our new flagship digital SLR sets a new benchmark in image resolution and sharpness for 35mm format digital photography. Experience the EOS-1Ds Mark III first-hand in a dynamic studio environment where our specialist team will be on hand to answer any questions. 12th If you have a look on the Canon USA page I mentioned the other day, under the drivers/downloads section you can download the 1Ds3 manual. 11th I was told of another NZ price at $12150, so that looks to be the going rate there. Still no real details on delivery dates – for a collection of comments from people who have asked Canon, see this DPRthread. As well as useful links to 1Ds sources I’m getting several questions about cheaper 1Ds3 ‘offers’… Once again, if it looks too good to be true, then it probably is. An eBay 1Ds3 (with a free 8GB card!) I saw, priced at £4199, had ‘dodgy’ written all over it… of course the Hotmail ‘contact address’ helped alleviate any concerns I might have had ;-) As for an outfit called e-xcessories… I’ll just post a link to Resellerratings.com I was sent. 9th While Amazon is currently posting a December 10th delivery date, I’m told that Canon USA still have an ‘available in November 2007’ note on the 1Ds3 page. “They are on schedule for delivery right at the end of the month.” They expect to have [delivery] quantities a day or two before they receive the product once it is in the country. Initial deliveries are looking to be very small, and unless you are well up on a waiting list I suspect it may well be early next year before you can pick up a 1Ds3. There’s more 1Ds3 example pics in an article at LGD. October 31st Several Canon software updates are available for download (details on 5D2 page) It specifically includes 1Ds3 support. In the US I’m told (by JimW in Florida – thanks) that a major dealer is expecting their stock ‘any day’ from Canon and expects to ship pre-orders shortly after. Suffice to say, no-one has sent me any evidence of a shipping date that soon ;-) If anyone has any more dealer supplied shipping dates, then I’d be curious to know? A third person contacted me confirming the AJP calls. Meanwhile on the other side of the world it seems the official Australian ‘RRP’ price has been set at AUD$12,000 which is $1000 down from the original. If you are planning to use a WFT-E2/ E2A wireless unit with your 1Ds3, then there is a firmware update to V1.0.1 from Canon. The update addresses a problem where shutter firing could be delayed due to network problems. It now takes the shot and writes it to a card. The important thing to remember (and MR does emphasise this in his article) is that the cameras are pre-production – all sorts of options get tried out in testing, so it’s quite possible that the comments I had in August referred to a camera with less AA filtering. Read the first few posts in this follow-up LL thread for some -useful- comments on AA. 7th Someone has kindly posted some 1Ds3 pics on DPR. However, I note persistant rumours of the 1Ds3 being delayed due to the need to ‘fix’ 1D3 AF issues. I’ve had no credible info to back this up though, and wasn’t expecting my 1Ds3 until next month at the earliest. However, once I’m back in the UK I’ll be chasing up delivery estimates and the as yet nebulous pricing for the Ds3. Expect a lot more advertising emphasising the real image quality improvements between the 1Ds II and 1Ds III particularly in levels of detail. Pricing is very much a live issue for Canon. The price of the 1Ds III will drop progressively and end up about US $1000 more than the 1D III – reflecting more the manufacturing cost differences for the full frame. Initial price drop will happen either before launch (aimed at the D3 here, as much as anything) or shortly after launch. The price of the 1D III will also drop back progressively from US $5000 to closer to $4000 over time. Pre-orders from studios and shops have been strong. People are using DPP to process the RAW files for the time being, although many are converting to DNG for further work. Some of the amount of extra dynamic range that can be pulled out of the 14 bit files still needs some software tricks, but expect some pretty interesting results when the various specialist raw processing software vendors get to work. The amount of fine detail visible suggests that a relatively weak (compared to 1Ds2) AA filter is in use. The improvement looks more than would be expected from the 16->21 MP increase. High ISO noise performance is much better (than the Mk2) with less chroma noise and better detail. Unless you are working in a very well lit studio environment the P25 MF back is easily matched, and a P45 can be bested if the lighting is not optimal. Canon have also released a 38 page ‘White paper (PDF file)‘ all about the 1DsMk3. Lots of useful info and diagrams like the bigger microlenses picture below. Meanwhile… Nikon move to FF too (Nikon D3 info) Very interesting specs and well worth a look for 1Ds3 users – look to see some of these features in the ‘1Ds3N’ ;-) I’m told that some of them are already in there, it’s just a firmware issue, but when has Canon ever upgraded a camera with firmware only? 22nd Nikon to release a FF camera? – the Nikon forums are alight with speculation :-) All info we’ve found is on our 5D page. The Canon EOS-1Ds Mark III’s compact, lighter-weight magnesium alloy body is rugged and versatile enough to take out of the studio and into the field. The camera’s fast, five-frame-per-second (fps) shooting rate for bursts of up to 56 Large/Fine (21-megapixel) JPEGS or 12 RAW images is unmatched in its class, making it the ideal instrument for capturing the fluid motion and free-flowing lines of location-based fashion photography as well as a wide range of other professional photographic applications. The Canon EOS-1Ds Mark III professional digital single lens reflex camera is scheduled to begin shipping in November and will have an estimated selling price of $7,999 (the same price as its predecessor, the 16.7 megapixel EOS-1Ds Mark II). Developed and manufactured by Canon specifically for the EOS-1Ds Mark III Digital SLR, the camera’s new full-size 36 x 24 mm CMOS image sensor offers the highest resolution in its class, and is comprised of approximately 21.1 million effective pixels (5632 x 3750) set at a pitch of 6.4 microns. The user can select any one of six recording formats ranging from 21.0 megapixels in Large JPEG or RAW format, 16.6 or 11.0 megapixels in the two medium JPEG sizes, or 5.2 megapixels in the small JPEG or “sRAW” formats. In any JPEG format, the user can set one of ten compression rates for each image size. In sRAW mode, the number of pixels is reduced to one-fourth that of a standard RAW image and the file size is cut in half, while retaining all of the flexibility and creative possibilities associated with full-size, traditional RAW images. Fulfilling the ultra-low noise, ultra-high image quality promise of the EOS-1Ds Mark III Digital SLR camera requires handling the enormous signal processing requirements of the camera’s 21-megapixel resolution and top continuous shooting speed of five fps. To accomplish this, Canon has incorporated two identical DIGIC III imaging engines into the camera for parallel (and hence, faster) signal processing. The CMOS sensor reads out to the dual “DIGIC III” processors simultaneously in eight channels. DIGIC III is the next generation of Canon’s proprietary image processing engine. This technology ensures the fine details and natural colours of images are optimally recorded and, as an added bonus, is responsible for the EOS-1Ds Mark III SLR’s high-speed performance, faster signal processing and more efficient energy consumption. Adding to the improved virtuosity of the images captured by the EOS-1Ds Mark III Digital SLR camera is the camera’s 14-bit Analog-to-Digital (A/D) conversion process. Able to recognize 16,384 colours per channel (four times the number of colours recognized by the EOS-1Ds Mark II Digital SLR camera’s 12-bit conversion capability), this line-leading model is able to produce images with finer and more accurate gradations of tones and colours. 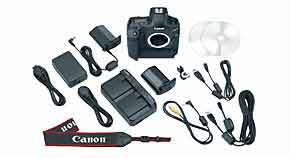 Additionally, given the significantly larger image file sizes created by the EOS-1Ds Mark III Digital SLR camera, Canon has provided compatibility with the new Ultra Direct Memory Access (UDMA) compact flash memory card specification, which enables ultra-high-speed data transfer to the card. Utilizing a UDMA compliant card doubles the data transfer speed compared to a conventional memory card, putting the new EOS-1Ds Mark III on par with the 10.1-megapixel EOS-1D Mark III camera, even though the pixel count of this new model is more than twice as large. The EOS-1Ds Mark III autofocus system – first introduced earlier this year on the EOS-1D Mark III Digital SLR – has 45 AF points including 19 high-precision cross-type points and 26 Assist AF points. This new array allows the 19 cross-type points to be divided into groups of nine inner and nine outer focusing points plus a centre point, which makes picking an individual focusing point much faster and easier than going through all 45. 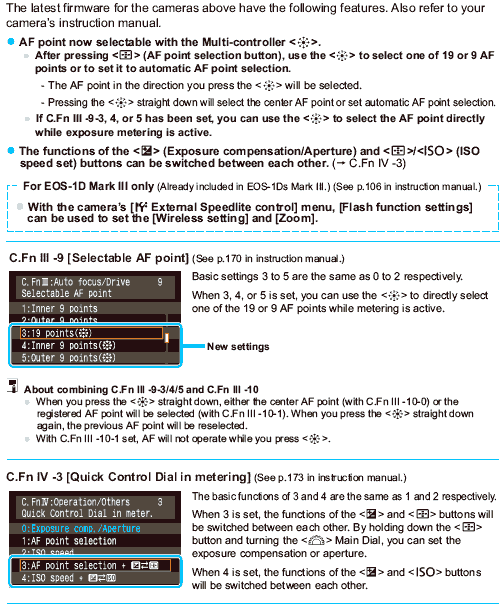 During manual AF point selection, the AF point area is expandable in two stages via Custom Function control. At the request of sports and wildlife photographers, a new micro-adjustment feature allows for very fine changes in the AF point of focus for each lens type in use, along with the addition of adjustable focus-tracking sensitivity as another sophisticated new AF feature. Other new components in the AF system include the reconfigured concave submirror and the secondary image formation lens, both products of Canon’s vast expertise in optical engineering. Finally, the low-light sensitivity of the new AF sensor has been doubled to EV-1 for superior performance, compared with earlier EOS digital SLRs. 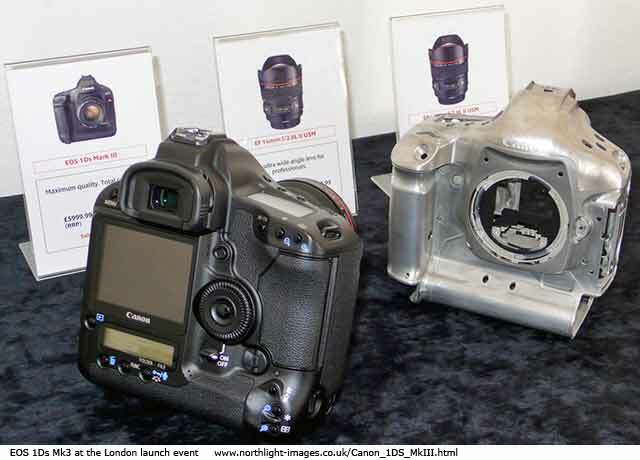 One of the dynamic innovations incorporated into new EOS Digital SLRs – and optimized for professional shooters on the EOS-1Ds Mark III Digital SLR – is Canon’s Live View shooting mode which provides photographers with an expanded and exceedingly convenient set of shooting options beyond the conventional SLR through-the-lens viewing. Framing and shooting subjects using the camera’s LCD screen affords the shooter the same 100 percent field of view provided by the optical viewfinder – this is a full-frame digital SLR after all – but Live View has the added advantage of allowing the image to be more easily composed on the camera’s bright and brilliant 230,000-pixel, three-inch LED screen. Additionally, the LCD-viewed image can be magnified by five or ten times in order to ensure that the shot is optimally focused. Live View is at its best during tripod shooting, particularly for close-up photography where precise focusing is imperative. As a side benefit, the Live View shooting mode helps to reduce vibration by lifting the reflex mirror out of the optical path well in advance of the exposure, improving image quality at slow shutter speeds. Additionally, as the release time lag is miniscule, even instantaneous movements like a bird taking flight can be readily captured. The shutter charge sound can be delayed and made quieter than normal in Live View mode to avoid spooking wildlife or disturbing people nearby with unwanted camera sounds. If a user is going to be several feet away from the camera, such as in some studio settings, the EOS-1Ds Mark III can be connected by cable to a computer via its USB 2.0 High-Speed interface. The camera can also be operated remotely at distances up to 492 feet with the assistance of the optional Wireless File Transmitter WFT-E2A which allows users to view images directly off the camera’s sensor in virtually real-time, with the ability to adjust many camera settings quickly and easily. Easy to read, even in outdoor conditions such as bright sunlight, the EOS-1Ds Mark III Digital SLR camera features a three-inch, 230,000-pixel wide angle LCD display screen. 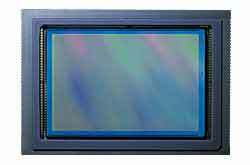 The TFT colour liquid-crystal monitor features seven user-settable brightness levels and a wide, 140-degree viewing angle, both horizontally and vertically. An added advantage of the large, three-inch display size is the ability to utilize a larger font size for text, making it easier to read setting and menu options on the screen. Canon extends its “ease-of-reading” policy to the EOS-1Ds Mark III’s viewfinder as well. Bright and clear with zero distortion and a 100 percent picture coverage and a magnification factor of .75x, it is the finest viewfinder ever placed in an EOS camera. Another first for a professional digital SLR of this caliber is Canon’s complete dust management solution, called the EOS Integrated Cleaning System. The new CMOS image sensor is designed with a lightweight infrared absorption glass cover that vibrates for 3.5 seconds when the camera is turned on or off. This brief delay can be cancelled immediately upon start-up by pressing the shutter button half way. Dust that has been shaken or blown loose of the sensor is trapped by adhesive surfaces surrounding the sensor unit housing, preventing the problematic particles from reattaching themselves to the filter when the camera moves. Like its sibling, the EOS-1D Mark III, the shutter of the EOS-1Ds Mark III Digital SLR camera carries a durability rating of 300,000 cycles and, though it generates less dust, it still charges itself three times during the manual cleaning process so that dust is shaken off the shutter curtains as well. This cleaning system uses very little battery power and can be turned off in the custom function menu. The second part of the dust management system is a software solution that maps the location of any spots that may remain on the sensor. The mapped information is saved as Dust Delete Data and attached to the image file. Subsequently, the offending dust information is subtracted from the final image during post processing, using the supplied Digital Photo Professional software. The entire body of the EOS-1Ds Mark III, including its internal chassis and mirror box, is made of an advanced magnesium alloy for exceptional strength and rigidity. Comprehensive weatherproofing at 76 locations on the camera body ensures superior reliability, even when shooting in harsh environments. Together with the 300,000-cycle shutter durability rating, these features result in a camera that, even though it is six ounces lighter than the EOS-1Ds Mark II, can truly withstand even the most severe shooting conditions. Among the most valuable features of the EOS-1Ds Mark III Digital SLR is its compatibility with Canon’s new Picture Style Editor 1.0 software. With PSE, photographers can personalize the look of their photographs by inputting their own preferred image processing parameters, including custom tone curves. The EOS-1Ds Mark III Digital SLR also ships with the latest versions of Canon’s powerful software applications, including Digital Photo Professional 3.2 and EOS Utility 2.2, which support the camera’s Remote Live View and Dust Delete Data functions, as well as incorporating a broad range of additional improvements designed to improve image quality and speed up workflow. Particularly noteworthy in DPP 3.2 is a new Lens Aberration Correction Function that corrects various image defects such as chromatic aberration, colour blur, vignetting and distortion. Initially, the Lens Aberration Correction Function will support images captured by the EOS-1Ds Mark III and 11 other EOS Digital SLRs using any of 29 individual EF and EF-S lenses. Also included are ZoomBrowser EX 6.0 and ImageBrowser 6.0 for easy browsing, viewing, printing and archiving with compatible computer operating systems, including Microsoft Windows Vista and Windows XP, as well as Mac OS X.
Sydney, 20 August 2007 – Canon, who this year is celebrating 70 years of technology innovation, made history today with the announcement of the EOS-1Ds Mark III – the flagship D-SLR camera with the highest resolution sensor ever seen in this category. Complete with a Canon-developed 21.1 Megapixel Full-Frame CMOS Sensor for extreme detail, and Dual DiG!C III Image Processors for natural colour reproduction and high-speed image processing, the EOS-1Ds Mark III is an irresistible proposition for professionals who require the highest quality images and performance for the studio or on location. Released earlier this year, Canon’s high-speed EOS-1D Mark III has been independently recognised as the best SLR ever made. Today, the EOS-1Ds Mark III eclipses this, setting even higher standards with its full frame, ultra-high resolution capture. When superior results are critical to your profession, the EOS-1Ds Mark III delivers. Canon’s unrivalled 21.1 Megapixel Full-Frame CMOS sensor is able to capture ultra-fine detail never seen before in a D-SLR. Dual DiG!C III Image Processors ensures superb detail, high-speed image processing and 14-bit Analogue-to-Digital conversion for fine colour gradation. The flexibility to simultaneously capture both RAW and JPEG files types (including sRAW) vastly enhances the camera capabilities. The EOS-1Ds Mark III is the ultimate D-SLR, capturing 21.1 megapixel images at a rate of five frames per second in a continuous burst up to 56 shots. Additional enhanced functionality includes a 45-pont AF system (including 19 cross-type AF points and 26 assist AF points), high shutter speed of up to 1/8000 second and high speed flash synchronisation speed of 1/250 second, and selectable ISO speeds from 100-1600 with ISO expansion to 50 and 3200 via a Custom Function, to ensure this camera offers the best performance available in any D-SLR. Designed for studio, illustrative and commercial photographers, the EOS-1Ds Mark III offers superior features that professionals desire. With 57 Custom Functions available, operation of the EOS-1Ds Mark III can be tailored to suit the photographer’s individual preference. The addition of two Live View functions allows photographers to preview images in real time on the 3.0 inch LCD or an external monitor to achieve precise image composition and focusing. Built for the demands of the toughest environments, the EOS-1Ds Mark III has a strong and reliable magnesium alloy body with over 70 dust and moisture resistant seals. The EOS Integrated Cleaning System reduces dust on the sensor ensuring uncompromised results. 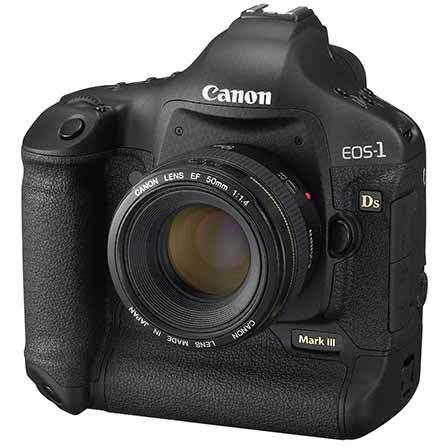 The Canon EOS-1Ds Mark III (RRP $12,999.00) is available from November 2007 through Canon dealers nationally. For more information customers can contact Canon on 1800 021 167, or visit the website at Canon.com.au. Developed and manufactured by Canon specifically for the EOS-1Ds Mark III digital SLR, the camera’s new full-size 36 x 24-millimeter CMOS image sensor offers the highest resolution in its class and is comprised of approximately 21.1 million effective pixels (5632 x 3750) set at a pitch of 6.4 microns. The user can select any one of six recording formats ranging from 21.0 megapixels in Large JPEG or RAW format, 16.6 or 11.0 megapixels in the two medium JPEG sizes, or 5.2 megapixels in the small JPEG or “sRAW” formats. In any JPEG format, the user can set one of ten compression rates for each image size. In sRAW mode, the number of pixels is reduced to one-fourth that of a standard RAW image and the file size is cut in half, while retaining all of the flexibility and creative possibilities associated with full-size, traditional RAW images. Fulfilling the ultra-low noise, ultra-high image quality promise of the EOS-1Ds Mark III Digital SLR camera requires handling the enormous signal processing requirements of the camera’s 21-megapixel resolution and top continuous shooting speed of five fps. To accomplish this, Canon has incorporated two identical DIGIC III imaging engines into the camera for parallel (and hence, faster) signal processing. The CMOS sensor reads out to the dual “DIGIC III” processors simultaneously in eight channels. DIGIC III is the next generation of Canon’s proprietary image processing engine. This technology ensures the fine details and natural colours of images are optimally recorded and, as an added bonus, is responsible for the EOS-1Ds Mark III SLR’s high-speed performance, faster signal processing, and more efficient energy consumption. The EOS-1Ds Mark III autofocus system–first introduced earlier in 2007 on the EOS-1D Mark III Digital SLR–has 45 AF points including 19 high-precision cross-type points and 26 Assist AF points. This new array allows the 19 cross-type points to be divided into groups of nine inner and nine outer focusing points plus a centre point, which makes picking an individual focusing point much faster and easier than going through all 45. During manual AF point selection, the AF point area is expandable in two stages via Custom Function control. At the request of sports and wildlife photographers, a new micro-adjustment feature allows for very fine changes in the AF point of focus for each lens type in use, along with the addition of adjustable focus-tracking sensitivity as another sophisticated new AF feature. Other new components in the AF system include the reconfigured concave submirror and the secondary image formation lens, both products of Canon’s vast expertise in optical engineering. Finally, the low-light sensitivity of the new AF sensor has been doubled to EV-1 for superior performance compared with earlier EOS Digital SLRs. 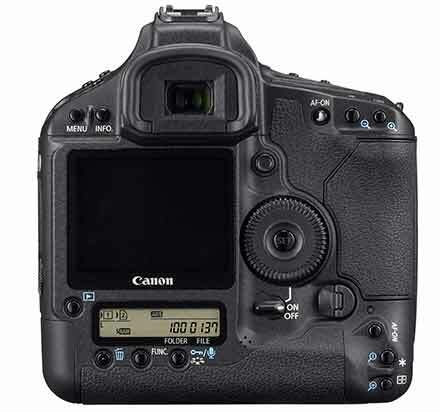 One of the dynamic innovations incorporated into new EOS Digital SLRs–and optimized for professional shooters on the EOS-1Ds Mark III digital SLR–is Canon’s Live View shooting mode, which provides photographers with an expanded and exceedingly convenient set of shooting options beyond the conventional SLR through-the-lens viewing. Framing and shooting subjects using the camera’s LCD screen affords the shooter the same 100 percent field of view provided by the optical viewfinder–this is a full-frame Digital SLR after all–but Live View has the added advantage of allowing the image to be more easily composed on the camera’s bright and brilliant 230,000-pixel, three-inch LED screen. Additionally, the LCD-viewed image can be magnified by five or ten times in order to ensure that the shot is optimally focused. If a user is going to be several feet away from the camera, such as in some studio settings, the EOS-1Ds Mark III can be connected by cable to a computer via its USB 2.0 High-Speed interface. The camera can also be operated remotely at distances up to 492 feet with the assistance of the optional Wireless File Transmitter WFT-E2A, which allows users to view images directly off the camera’s sensor in virtually real time, with the ability to adjust many camera settings quickly and easily. Easy to read, even in outdoor conditions such as bright sunlight, the EOS-1Ds Mark III Digital SLR camera features a three-inch, 230,000-pixel wide-angle LCD display screen. The TFT colour liquid-crystal monitor features seven user-settable brightness levels and a wide, 140-degree viewing angle, both horizontally and vertically. An added advantage of the large, three-inch display size is the ability to utilize a larger font size for text, making it easier to read setting and menu options on the screen. Canon extends its “ease-of-reading” policy to the EOS-1Ds Mark III’s viewfinder as well. Bright and clear with zero distortion, a 100 percent picture coverage, and a magnification factor of .75x, it is the finest viewfinder ever placed in an EOS camera. Like its sibling, the EOS-1D Mark III, the shutter of the EOS-1Ds Mark III Digital SLR camera carries a durability rating of 300,000 cycles and, though it generates less dust, still charges itself three times during the manual cleaning process so that dust is shaken off the shutter curtains as well. This cleaning system uses very little battery power and can be turned off in the custom function menu. Among the most valuable features of the EOS-1Ds Mark III Digital SLR is its compatibility with Canon’s new Picture Style Editor 1.0 software. With PSE, photographers can personalize the look of their photographs by inputting their own preferred image processing parameters, including custom tone curves. The EOS-1Ds Mark III Digital SLR also ships with the latest versions of Canon’s powerful software applications, including Digital Photo Professional 3.2 and EOS Utility 2.2, which support the camera’s Remote Live View and Dust Delete Data functions, as well as incorporating a broad range of additional improvements designed to improve image quality and speed up workflow. Particularly noteworthy in DPP 3.2 is a new Lens Aberration Correction Function that corrects various image defects such as chromatic aberration, colour blur, vignetting, and distortion. Initially, the Lens Aberration Correction Function will support images captured by the EOS-1Ds Mark III and 11 other EOS Digital SLRs using any of 29 individual EF and EF-S lenses. Also included are ZoomBrowser EX 6.0 and ImageBrowser 6.0 for easy browsing, viewing, printing, and archiving with compatible computer operating systems, including Microsoft Windows Vista and Windows XP, as well as Mac OS X. While its large diameter, high-precision aspherical and UD elements, optimized lens element positioning, and flare and ghost-reducing lens coating ensure that this lens delivers the top optical performance in its professional class, Canon has added other features photographers have been asking for–improved dust and water resistance incorporated around the mount, switch panel and focusing ring, and a round aperture that creates a nice background blur and makes it easier to recognize an out-of-focus scene in less than brightly lit conditions. Furthermore, Canon has created a new lens cap specifically for the EF 14mm f2.8L II USM that is held to the lens by a stopper. 40D – it’s ready, but they did have a 40D ready in Feb/March, but it was regarded as just a bit to similar to everything else. It seems that Canon have put a lot into the ‘new’ 40D to get back market leadership in this segment from Nikon. Features include: 14 bit processing, highlight preservation, multiple custom functions, faster, half the noise level of the 30D, more weatherproofing. Lots of ‘trickle down’ features from their pro models. Their marketing campaign is really going to emphasise the semi-pro angle and the marketing will emphasise the ‘pro’ heritage. 5D replacement – Now ‘feature complete’. Canon is working on the timing, most likely early 2008 [PMA is Jan 31 to Feb 2] Features include 16MP, Digic III and 14 bit. 400D replacement – March 2008. 14 bit, Digic III, highlight preservation. IS lens as standard. Canon China has reinstated the 1Ds2 and 30D on their front page – and expectations are for a Canon announcement (G7 and 30D replacements?) on Monday.